Many spindles are neglected and not kept clean on a regular maintenance program. As grease and oil build up in the spindle, the toolholder is no longer making proper contact with the spindle. A dirty spindle leads to poor tool life, runout, and poor tolerances. JM Spindle Cleaners are made from anodized aluminum and are strong enough to not collapse in the spindle while cleaning. 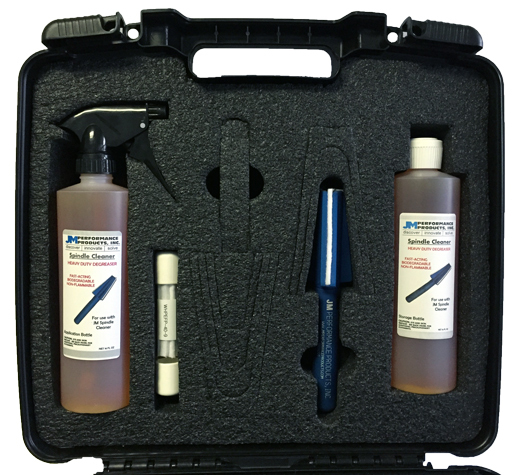 We offer spindle cleaner kits in 30, 40, 45 and 50 tapers and feature replaceable cleaning strips. Spindle cleaners come with a removable handle that can be used with all cleaning head tapers. To clean a spindle, start at a very low revolution and spray the degreaser spray onto the area to be cleaned. Avoid over spraying any painted surface. Wait 30 seconds and then manually place a clean spindle cleaner into the spindle. Make proper contact with all surfaces of the spindle. Remove the spindle cleaner and replace cleaning pads and repeat process. Repeat until all grease and dirt is removed. Proper taper contact between the toolholder and the spindle is critical for tool performance. After time grease, dirt, and materials get galled into the spindle affecting tooling performance. To recondition spindle tapers, JM Performance Products has introduced its Spindle Taper Restoration Kit. The AT3, precision-taper head used with the refinishing media can restore the original taper finish. The media will remove all material that has been galled into the spindle taper without damaging the original taper. 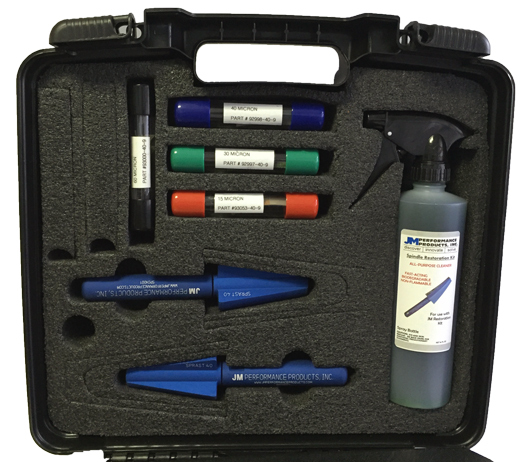 The kit consists of four different micron finishes of material, a spindle cleaner, a precision taper restoration head, a handle and a carrying case. The cleaning strips are pressure sensitive and coated with an aluminum oxide media. Available in 30, 40, 45 and 50 tapers.